Hodgson Brothers Relay:- Well! It don't come much better. Much more news from our team runners will help out. Results. The Ladies seem to have got four good pairings, with runners who have these Lakeland hills in the legs. Nicky and Jenny held things together on the final leg, with fast closing Helm Hill (fastest leg) closing in , nearly. The Vets also seem to have had three strong first legs, leaving John Hunt and Spyke the task of reining in Ambleside. They managed this at the top of St Sunday Crag, and opened the gap on that final descent. The Ladies and Vets are well used to winning, but with Borrowdale winning for the previous 19 years, the Holy Grail of fell running was to win this Relay outright. Rob Little has managed to get, at last, what seems to be the best eight runners all turning out, knowing their legs. Borrowdale were ahead, just, at the first three change overs, and Rhys and Kris put in the fastest leg, most impressively, to win decisively. Go Big Moor - from Holmesfield. 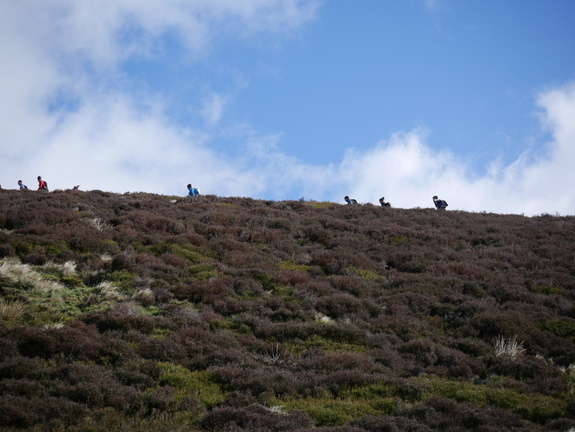 Levisham Limping - N Y Moors - results.